The strip foundation is the foundation element that behaves, simultaneously, like a spread foot-ing and a beam. Strip foundations combine the properties of spread footings and connecting beams. 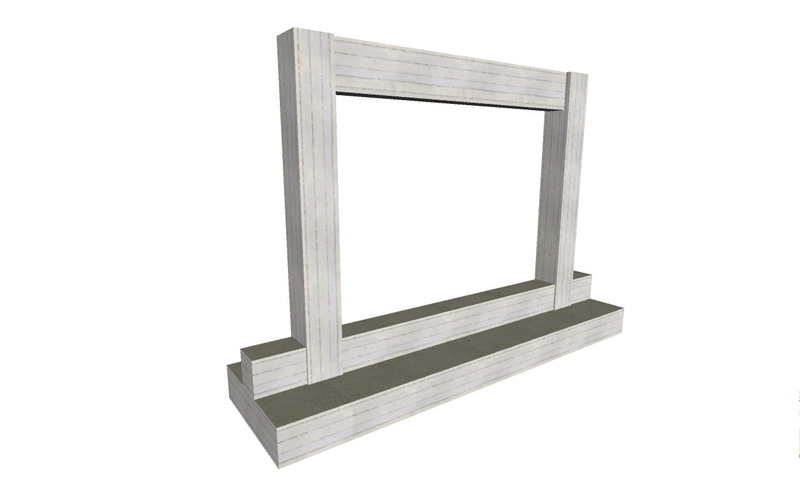 Two-column frame with a strip foundation that extends (beyond the columns) on both sides "project:foundation140"
The strip foundation behaves in a way similar to that of spread footings tied together by a con-necting beam. However, due to the fact that the footing and the foundation wall form a unified body along the entire length of the structure, the systems inertia is larger therefore, its behav-iour is more satisfactory. When no earthquake forces are applied, the soil pressures are symmetrically distributed along the entire length of the strip foundation. The stresses created to the soil are larger in the area of columns. During an earthquake, one edge is over-stressed thus creating larger soil pressures while at the same time, the other edge is relieved. When the seismic forces shift direction the footings’ over-stressing symmetrically changes. The deformation and stress applied upon the strip foundation are large and continuously reversing. The footing behaves like a bilateral cantilever (fixed upon the strip foundation’s wall). 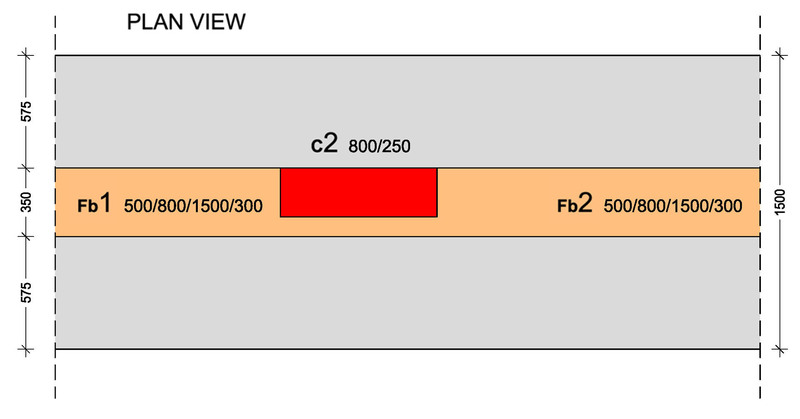 Its behav-ior is similar to the behavior of the spread footings therefore, it requires reinforcement to its lower fiber, as shown at the figure below. The soil’s reaction, stresses the footing slab in an upward direction. This causes deformations at the lower surface of the footing which are carried by the reinforcement. 1. Strip foundations behave extremely well during an earthquake. Depending upon the seismic forces’ direction, one edge is heavily over-stressed. In large parts of the strip foundation, the deformation continuously reverses and therefore, it requires strong rein-forcement both at the upper and lower fiber, especially at the first and last opening of a continuous strip foundation. "project:foundation145"
2. In order to have a more efficient behavior of the strip foundation’s boundary parts, it is useful to extend the strip foundation beyond the edge columns to an appropriate length. The behavior of this element is quite obvious since the footing distributes the applied loads to the soil, it is stressed by the soil’s reaction and behaves like a cantilever slab while the founda-tion wall behaves in a way similar to a beam. 3-D figure of the a strip foundation’s reinforcement "project:foundation150"
The footing’s reinforcement follows the same rules that apply to isolated spread footings how-ever, its one dimension is of a large length. 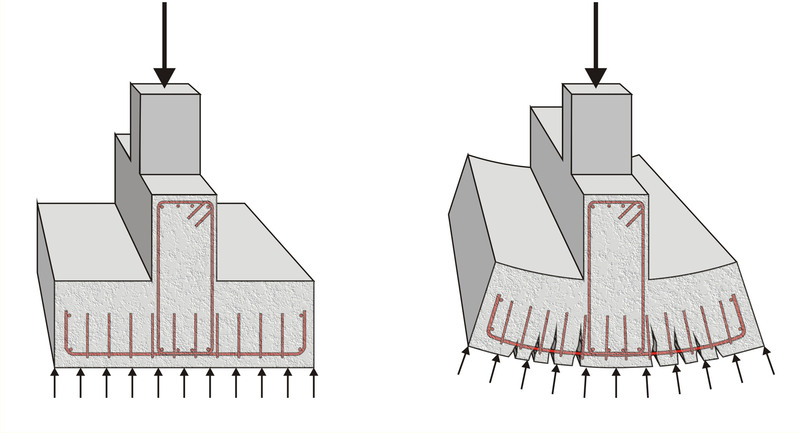 The foundation wall reinforcement follows the same rules that apply to connecting beams. 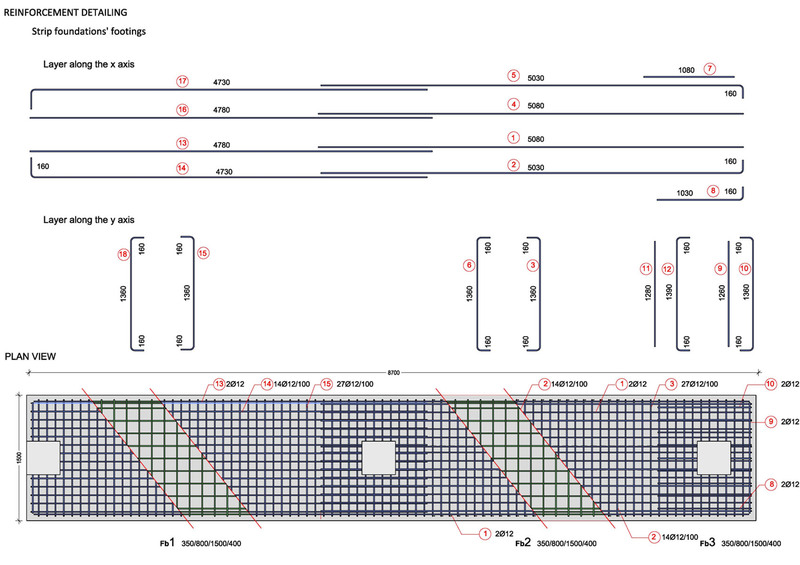 Its reinforcement details are analogous to the corresponding reinforcement details of the previously mentioned continuous connecting beam. In a strip foundation with a unified wall and footing (orthogonal section), the footing’s total depth is equal to the wall’s height. The only difference between the regular strip foundation and the strip foundation with a unified wall and footing is the fact that the latter requires reinforcement at the footing’s lower surface. Reinforcement of an orthogonal strip foundation "project:foundation160"
In the strip foundation where the footing and the wall have the same dimensions a hidden beam is formed. In this specific case, it has a four-legged stirrup while the footing is reinforced with a wire mesh placed both at its upper and lower part. 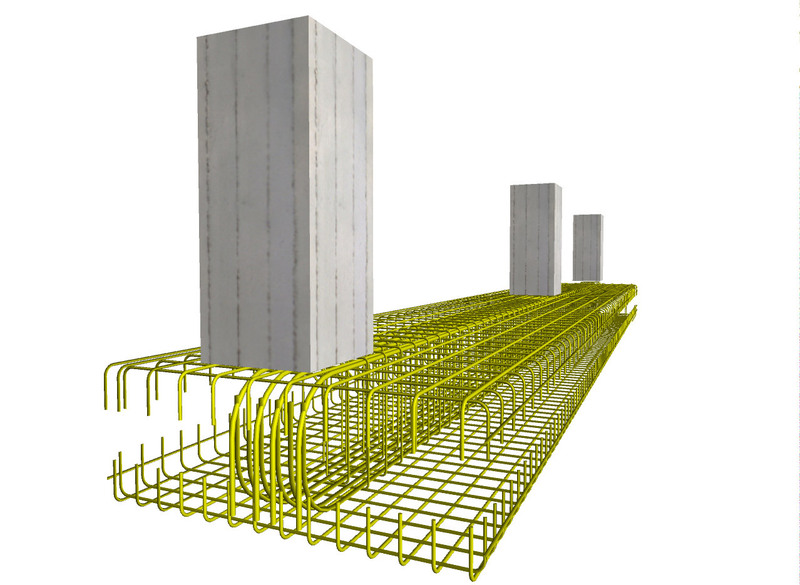 The footing’s reinforcement follows the rules that apply to isolated spread footings but rebars are placed both at the upper surface. 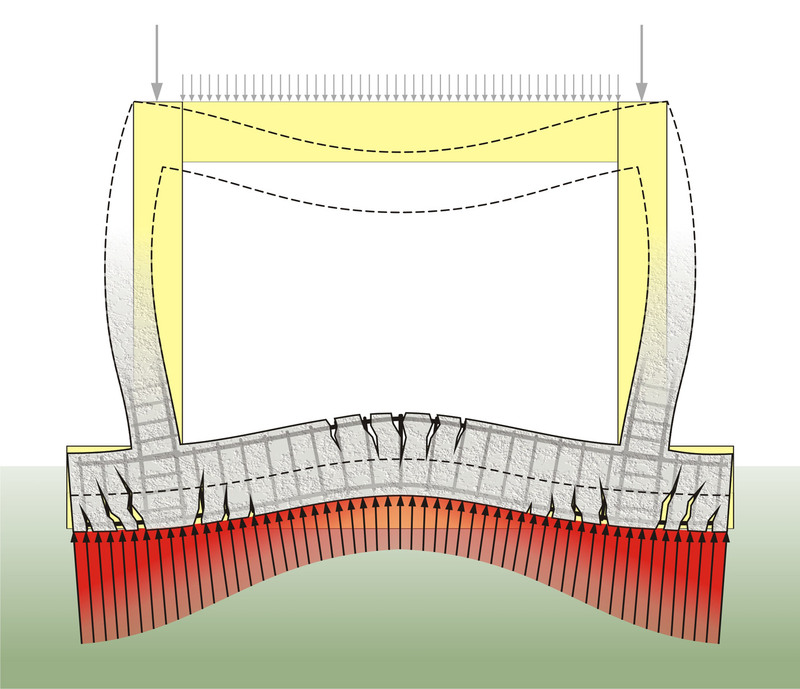 The wall reinforcement (in the case where the hidden beam is formed), follows the same rules that apply to connecting beams. The foundation wall reinforcement details of this specific strip foundation are similar to the rein-forcement details of the previously mentioned continuous connecting beam. Generally, it is useful to place stirrups inside the column and the beam of a joint area that be-longs either to the superstructure or the foundation. However practically, this is a strenuous procedure and therefore, it is preferred, in priority order, to place stirrups inside the columns. When the foundation wall extends beyond the face of the column, additional vertical re-inforcement is required. This reinforcement may be provided in the form of regular stirrups or additionally fitted stirrups in the shape of a hairpin, as shown at the following figures. The column with 800/250 section, in the common wall of the building, is partially seated upon the strip foundation that has a wall of 350/800. 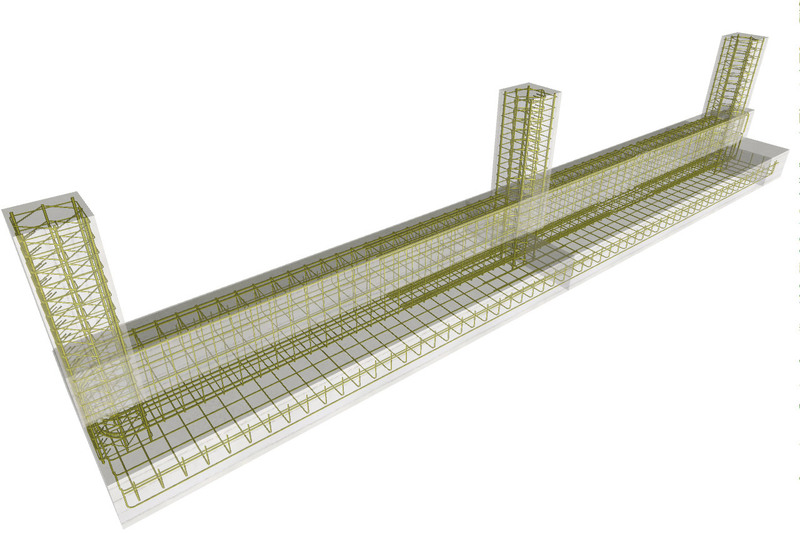 After the implementation of the stirrup cages inside the strip foundation walls, the wall’s part that extends beyond the column remains un-reinforced along the vertical axis. 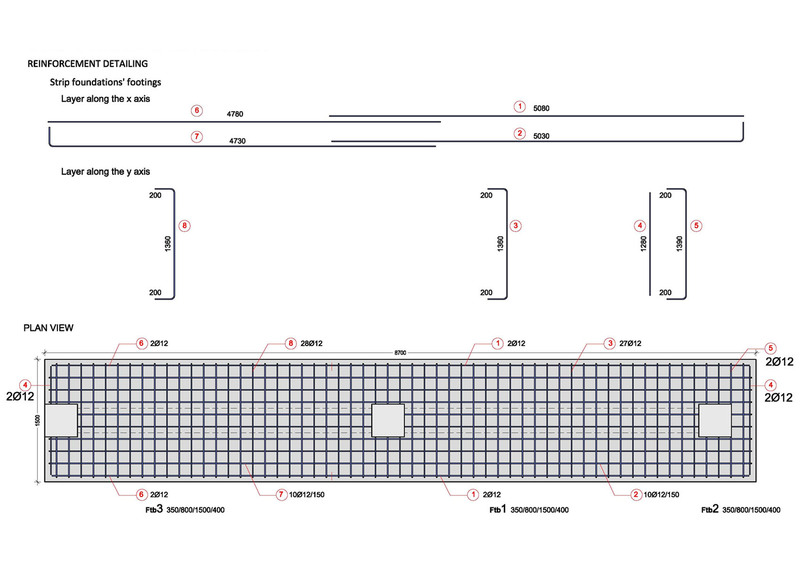 The hairpin bars (in red colour) that will be placed in that area are shaped and placed in a separate phase. The vertical reinforcement positioned at the common area between the foundation wall and the column, is comprised of hairpin bars placed afterwards one by one. In that area, the vertical reinforcement at the back side of the strip foundation is provided by the column’s longitudinal reinforcement (i.e. from the column rebars). The ends of the hairpin bars may have a straight length or they may be bent in the form of a hook, depended upon which of the two is more feasible (see relevant note). 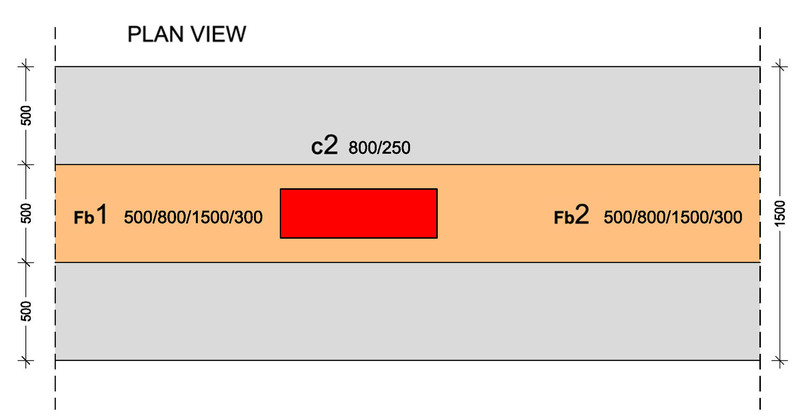 The 800/250 column is seated upon the center of the strip founda-tion beam that has a section of 500/800. 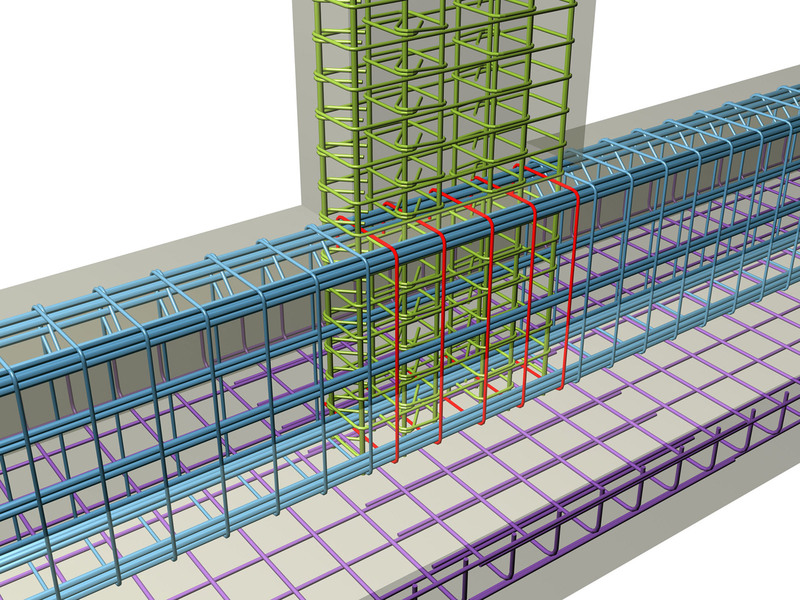 After the implementation of the stirrup cages inside the strip foundations’ walls, the wall parts that extend beyond the column remains un-reinforced along the vertical axis. The double hair-pin rebars (in red colour) that will be placed in that area are shaped and positioned in a sepa-rate phase. 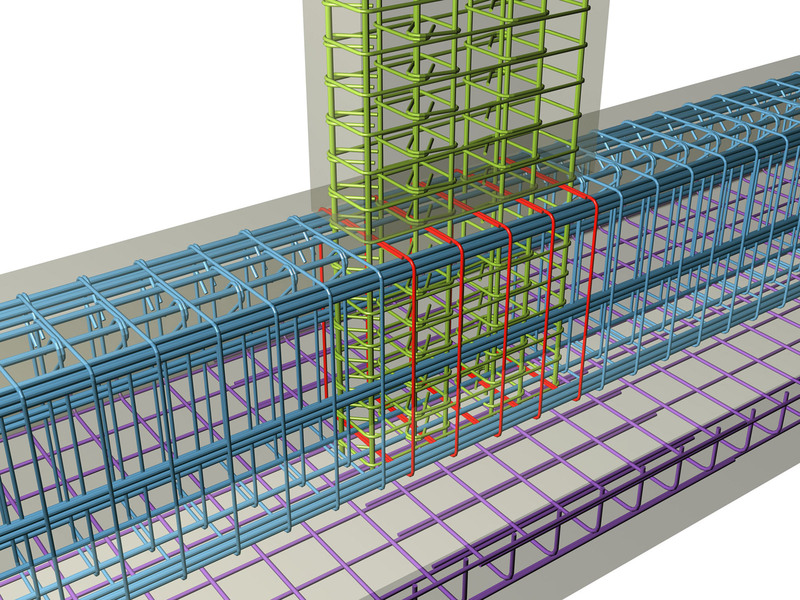 The vertical reinforcement positioned at the common area between the foundation wall and the column, is comprised of bilateral hairpin bars positioned one by one on both sides of the beam. 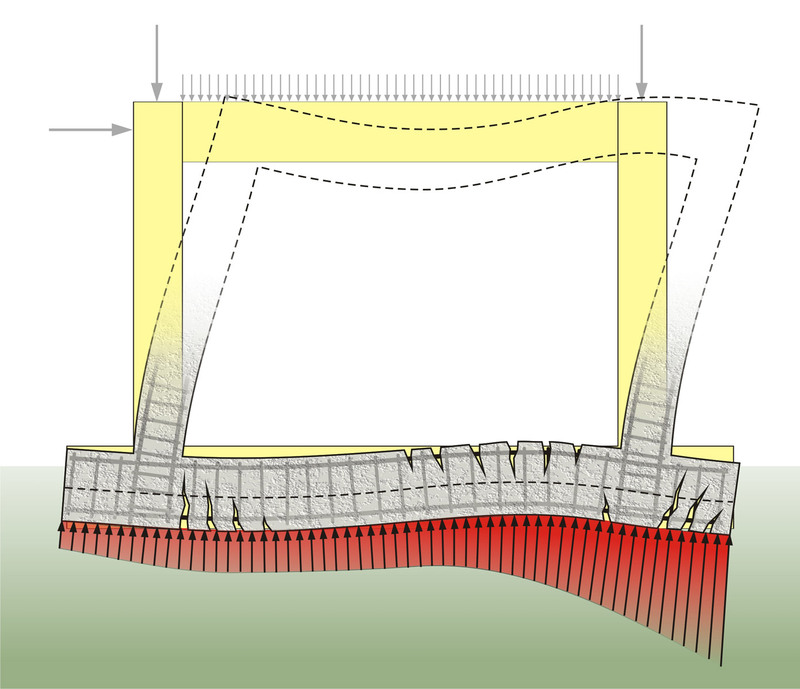 In this specific example, the stirrups placed inside the strip foundations’ wall are four legged and after the cages’ implementation the outer part of the wall, in the column area, remains without vertical reinforcement. The inner transverse reinforcement (the 2 middle legs of the 4 legged stirrups) in that specific area of the foundation wall is provided by the column rebars. 1. There is no need to mention that in order to assemble any of the previously mentioned reinforcements, the formwork must not be constructed until after the completion of the reinforcing. 2. If there is access to those specific parts of the strip foundation, it is useful to form the hooks at the ends of the hairpin bars either during their shaping or after their implementation. 3. 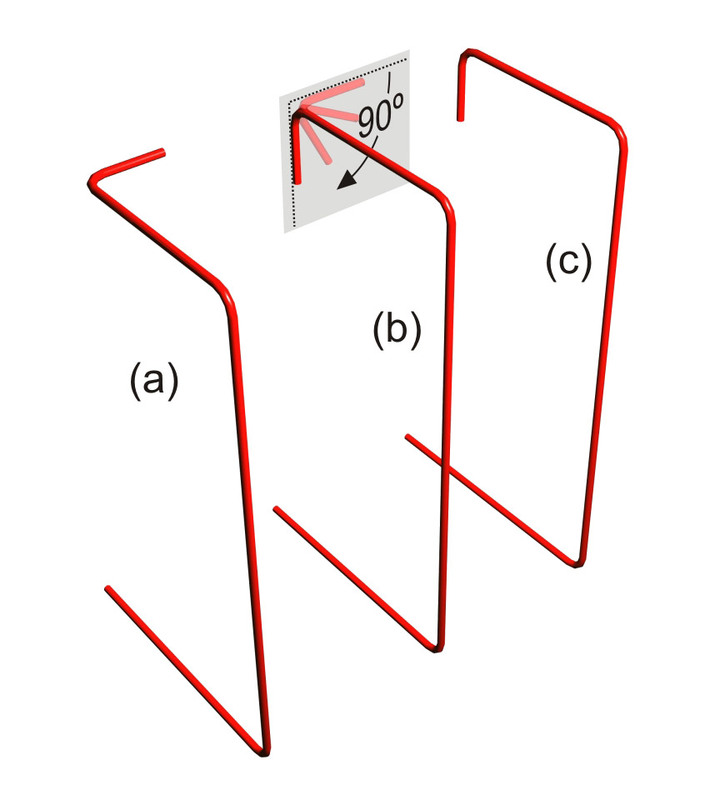 The next figure shows a combination of prefabricated hooks and proper fitting after the re-bars’ implementation. The 90ο bend can be achieved by means of a special bending tool by the steel fixer.